"Indochina" redirects here. For the French colonial regime, see French Indochina. Mainland Southeast Asia (or the Indochinese Peninsula) is the continental portion of Southeast Asia. It lies east of the Indian subcontinent and south of China and is bordered by the Indian Ocean to the west and the Pacific Ocean to the east. It includes the countries of Myanmar (Burma), Thailand, peninsular Malaysia, Laos, Cambodia and Vietnam. 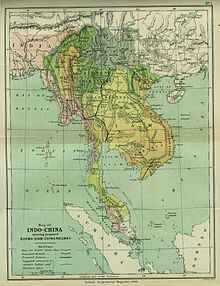 The term Indochina (originally Indo-China) was coined in the early nineteenth century. It emphasizes the cultural influence on the area of Indian civilization and Chinese civilization. The term was later adopted as the name of the colony of French Indochina (today's Cambodia, Vietnam, and Laos). The Indochinese Peninsula projects southward from the Asian continent proper. It contains several mountain ranges extending from the Tibetan Plateau in the north, interspersed with lowlands largely drained by three major river systems running in a north–south direction: the Irrawaddy (serving Myanmar), the Chao Phraya (in Thailand), and the Mekong (flowing through Northeastern Thailand, Laos, Cambodia and Vietnam). To the south it forms the Malay Peninsula, on which are located Southern Thailand and Peninsular Malaysia; the latter is variably considered part of Mainland Southeast Asia or separately as part of Maritime Southeast Asia. In biogeography, the Indochinese Region is a major biogeographical region in the Indomalaya ecozone, and also a phytogeographical floristic region in the Paleotropical Kingdom. It includes the native flora and fauna of all the countries above. The adjacent Malesian Region covers the Maritime Southeast Asian countries, and straddles the Indomalaya and Australasian ecozones. Mainland Southeast Asia contrasts with Maritime Southeast Asia, mainly through the division of largely land-based lifestyles in Indochina and the sea-based lifestyles of the Malay and Philippine archipelagos, as well as the dividing line between the Austroasiatic, Tai–Kadai, Sino-Tibetan languages (spoken in Mainland Southeast Asia) and Austronesian languages (spoken in Maritime Southeast Asia). The languages of the mainland form the Mainland Southeast Asia linguistic area: although belonging to several independent language families, they have converged over the course of history and share a number of typological similarities. The countries of mainland Southeast Asia received cultural influence from both India and China to varying degrees. Some cultures, such as those of Cambodia, Laos, Thailand and Malaysia are influenced mainly by India with a smaller influence from China. Others, such as Vietnam, are more heavily influenced by Chinese culture with only minor cultural influences from India, largely via the Champa civilization that Vietnam conquered during its southward expansion. Today, most of these countries also show pronounced Western cultural influences which began during the European imperialism in Asia and colonialism in Southeast Asia. The region except Malaysia is predominantly Buddhist. The origins of the name Indo-China are usually attributed jointly to the Danish-French geographer Conrad Malte-Brun, who referred to the area as indo-chinois in 1804, and the Scottish linguist John Leyden, who used the term Indo-Chinese to describe the area's inhabitants and their languages in 1808. Scholarly opinions at the time regarding China's and India's historical influence over the area were conflicting, and the term was itself controversial—Malte-Brun himself later argued against its use in a later edition of his Universal Geography, reasoning that it over-emphasized Chinese influence, and suggested Chin-India instead. Nevertheless, Indo-China had already gained traction and soon supplanted alternative terms such as Further India and the Peninsula beyond the Ganges. Later, however, as the French established the colony of French Indochina, use of the term became more restricted to the French colony, and today the area is usually referred to as Mainland Southeast Asia. Wikimedia Commons has media related to Indochina. ^ Marion Severynse, ed. (1997). The Houghton Mifflin Dictionary Of Geography. Houghton Mifflin Company. ISBN 0-395-86448-8. ^ "Malaysia". The World Factbook. Central Intelligence Agency. 2016-09-28. ^ "Thailand". The World Factbook. Central Intelligence Agency. 2016-09-28. ^ "Myanmar". The World Factbook. Central Intelligence Agency. 2016-09-28. Archived from the original on 2010-11-04. ^ "Cambodia". The World Factbook. Central Intelligence Agency. 2016-09-28. ^ "Vietnam". The World Factbook. Central Intelligence Agency. 2016-09-28. ^ 2008 Report on International Religious Freedom (Report). U.S. Department of State, Bureau of Democracy, Human Rights, and Labor. September 2008. Retrieved 2016-12-19. ^ Vimalin Rujivacharakul; et al., eds. (2013). Architecturalized Asia : mapping a continent through history. Hong Kong University Press. p. 89. ISBN 9789888208050. ^ Malte-Brun, Conrad (1827). Universal Geography, Or, A Description of All the Parts of the World, on a New Plan, According to the Great Natural Divisions of the Globe: Improved by the Addition of the Most Recent Information, Derived from Various Sources : Accompanied with Analytical, Synoptical, and Elementary Tables, Volume 2. A. Finley. pp. 262–3. ^ Wesseling, H. L. (2015). The European Colonial Empires: 1815–1919. Routledge. ISBN 9781317895060. ^ Keyes, Charles F. (1995). The golden peninsula : culture and adaptation in mainland Southeast Asia (Pbk. reprint ed.). University of Hawaii Press. p. 1. ISBN 9780824816964. Bernard Philippe Groslier (1962). The art of Indochina: including Thailand, Vietnam, Laos and Cambodia. Crown Publishers. History of the mountain people of southern Indochina up to 1945 (Bernard Bourotte, i.e. Jacques Méry, U.S. Agency for International Development, 195?